Movie Review: Have you ever looked at someone and wonder what is going on inside his head? This is the premise of “Inside Out”, a mind-blowing adventure from Pixar Animated Studios and released by Walt Disney, that takes us on an inventive trip into the mind of the 12-year-old Riley Anderson. Going through a delicate phase after moving from Minnesota to San Francisco with her parents, the responsive Riley struggles with disparate emotional states. These emotions actuate inside her head, each of them exhibiting a cute graphical personification. Joy has a luminous female representation, displaying a modern blue hair and a casual green dress; the melancholic, chubby Sadness shows huge round glasses over a blue face; Fear is an anxious gentleman featuring a thin body and long nose; Disgust is a green lady with no much expression; and finally, Anger is a red man whose head turns into a flaming missile whenever the situation justifies his actions. All of them have access to complex mechanisms in Riley’s mind, place where we can also find islands of personality (honesty, friendship, etc. ), golden spheres that represent memories, and the so important core memories. Also fantastic places such as Imaginationland and Dreamland can be reached, and if you want a shortcut to the headquarters, nothing better than call Riley’s childhood imaginary friend Bing Bong, a pink creature that is part elephant, part cat, part something else. It was funny to see how Joy and Sadness had to cooperate to help, and how everyone intervenes when Fear and Anger dominate. The American Oscar-winner, Pete Docter, keeps up the fantastic work both as a writer (“Toy Story”, “Wall.E”) and director of animation (“Monsters Inc.”, “Up”), here assisted by Ronaldo Del Carmen. 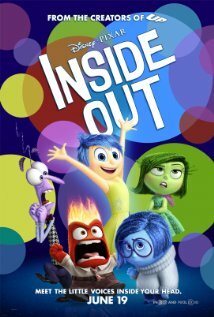 Lovely design, tactful and intelligible story, and rewarding message make of “Inside Out” the animated feature of the year.